I once heard a comedian say that humor should never be explained. Once a joke is dissected to reveal why exactly it’s funny, it falls apart and lies before us, so utterly humorless. Clearly this rule does not apply to writers, as we cannot help ourselves; we are nothing if not dissectors. Yet in all our analyses of lines of tension, character triangles, and point of view, we rarely attempt to examine a writer’s humor as craft. I will risk being unfunny in hopes of catching a glimpse of expert technique. 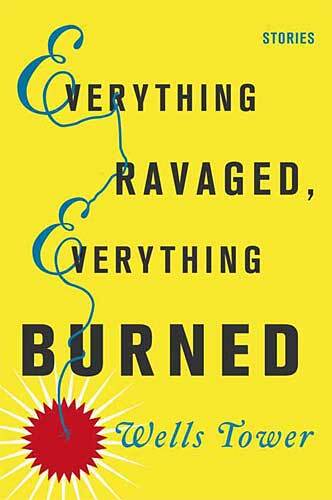 In the title story of emerging writer Wells Tower’s collection, “Everything Ravaged, Everything Burned,”(due out March 17th), the author details the exploits of a pillaging group of Vikings who blabber on like surfers. “Just as we were all getting back into the mainland domestic groove, somebody started in with dragons and drop blight across the North Sea” (1). In the first line, Tower immediately places us in a strange otherworld that is jutted against words like “groove” and “started in.” This jutting is what Arthur Koestler calls “bisociation,” or two planes of reference that intersect, and the point of contact creates strangeness, humor. The narrator wants to stay home with his girl and not go to work, a simple human longing, but the girl is a common-law named Pila and the work is pillaging a village. Mundane human emotions are rendered strange. Ben Marcus calls Wells Tower “a blindingly brilliant writer who does more than raise the bar for debut fiction: he hurls it into space. With the oversized heart of George Saunders, the demon tongue of Barry Hannah, and his very own conjuring tools that cannot here be named, Tower writes stories of aching beauty that are as crushingly funny and sad as any on the planet.” As much as I loved the title story, I am curious to see what other surprises this exciting new writer has to offer.